1 Cook spaghetti according to package directions; drain and rinse with cold water until completely cool. 2 Combine Hellmann's® or Best Foods® Real Mayonnaise, cayenne pepper sauce, soy sauce and ginger in large bowl. 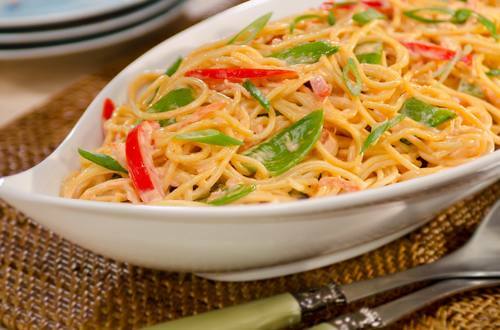 Stir in spaghetti, snow peas, red pepper and carrots. Serve chilled or at room temperature. Garnish with green onions.